In the UK there is a charity called the British Hen Welfare Trust. When battery farmed hens pass their optimum egg laying capacity (18-24 months) they are usually sold for cheap meat or culled – it’s cheaper to buy in a new high laying flock than have less eggs laid per hen. The BHWT arranges to buy these hens. 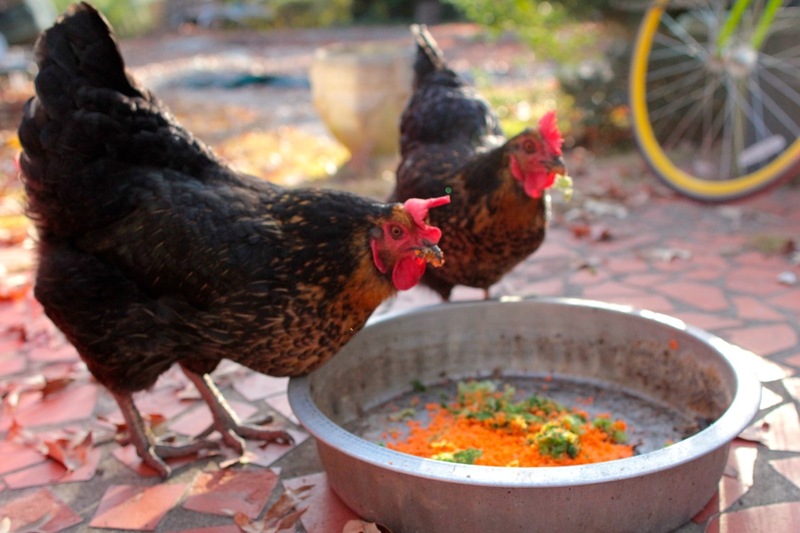 The hens are then re-homed to backyard chicken owners, farms and smallholdings. I bought my brother five rescued hens for his birthday last year. They arrived without feathers, they needed to learn the meaning of night and day, their leg muscles took time to develop enough for them to reach their roost. It’s a sad state of affairs when demand for cheap food results in cruelty and torture. I’m making Free P.H.I.L. t-shirts. I’ll post when they’re done. * Phil is a brave chicken I met in Tanzania. He was cruelly butchered – it was heartbreaking. But I believe his death inspired me to start the Free Persecuted Hens Into Liberty movement – Phil was a martyr of sorts.